Short of world war, it’s rare that a chief executive goes through a foreign policy month like President Obama’s August. U.S. warplanes struck in Iraq for the first time in years, as U.S. diplomats struggled to establish a new government in Baghdad. Islamic State militants beheaded an American journalist in Syria and spread their reach across the Middle East. War raged between Israel and Hamas in Gaza. In Afghanistan, U.S. plans for an orderly exit at the end of the year teetered on the brink of disaster. Russia all but invaded Ukraine and dared Obama to stop it. Libya descended into violent chaos. As events cascaded, Obama juggled rounds of vacation golf with public statements addressing the conflicts. But his cool demeanor, and the split-screen imagery of a president at play and at work, seemed ill-matched to the moment. The statement may have had the virtue of candor, as Obama weighs the military and diplomatic components of a U.S. response and seeks support from other nations. But it hardly projects an image of presidential resolve or decisiveness at a time of international turmoil. This week, Obama will have an opportunity to show global leadership at a crisis-packed summit with European allies. Immediately afterward, Secretary of State John F. Kerry will travel to the Middle East, where potential partners, waiting to see whether Obama has the capacity to chart a clear, decisive course, are hoping for direction. The world Obama now confronts is far different from the one he inherited when he came into office almost six years ago, and it is testing equally whether the style and substance of his leadership can win supporters and prevail against enemies. In the first years of his presidency, Obama’s principal foreign policy goals were far less reactive and were more dependent on his initiative and sense of timing. With a schedule for Iraq withdrawal already set, he developed policies for ending the then-faltering war in Afghanistan. In a pattern that would repeat itself on other issues, he deliberated for months, and then split the difference by simultaneously announcing a surge of troops and the timing of their departure. But as he tried to engage the world on his terms, Obama quickly found out that the world had thoughts and plans of its own. Far from the reset Obama sought with Russia, President Vladimir Putin sought a new balance of power through aggression in Ukraine. While Obama offered a fresh start for the United States in the Muslim world, the Arab Spring headed toward destabilization rather than democracy. Six years later, events seem to have spun out of his control, and Obama must react to the actions of others. Putin’s aggression in Ukraine has sparked the greatest East-West crisis since the Cold War. Islamic State advances have swallowed up a large swath of the Middle East and threaten a global upheaval far beyond the shock of al-Qaeda’s 2001 attacks. Obama now must contemplate what could be a lengthy and messy recommitment of U.S. military might in a region that continues to defy his efforts to create stability. Having promised respectful relations among the big powers, he must prove that the non-military tools of power — diplomacy and economic pressure — will eventually force Russia back within its own borders. Historian David Kennedy of Stanford University noted that Obama has struggled throughout his presidency to articulate a large and integrated vision in both domestic and foreign policy and contrasted that with the rhetorical and communications skills of Candidate Obama in 2008. Presidential advisers argue that Obama’s foreign policy management has born fruit, from getting the Syrians to give up their chemical weapons to bringing Iran to the negotiating table over its nuclear program to engendering the trust and credibility with other leaders to get European nations to support sanctions against Russia and rebuild a global coalition to deal with the Islamic State threat. A senior official called Obama’s Iranian policy “a perfect example of a disciplined response that potentially leads to a good outcome.” Yet even former secretary of state Hillary Rodham Clinton has expressed skepticism that Iranian negotiations will reach a successful conclusion and has been vocal in disagreeing with Obama’s earlier decisions not to intervene more directly to support rebel forces in Syria. Officials across the government spent Friday trying to clean up after Obama’s Thursday news conference. They insisted that his “no strategy” remark had been misinterpreted and that what was being portrayed as hesitation and delay was instead a sign of due diligence and a sharp focus on developing an effective long-term plan. Earlier statements by Defense Secretary Chuck Hagel and Gen. Martin Dempsey, chairman of the Joint Chiefs of Staff, about the overall threat posed by Islamic State militants and the necessity of eventually taking the fight into Syria, coupled with reports that the United States had launched surveillance flights over Syria, prompted speculation of potentially imminent military action. White House press secretary Josh Earnest denied a contradiction. “I think the president was pretty explicit that he is determined to make sure that every element of his national security strategy is thought through,” he said. As Obama sought to nudge the debate back into his deliberative comfort zone, others urged him toward action. Ryan Crocker, who has served as U.S. ambassador in Iraq, Afghanistan and Syria, pleaded with the president to stop deliberating and start acting. “I don’t think we have an alternative to swift, decisive military action to degrade ISIS in both Iraq and Syria. Give them no safe place to plan further attacks,” he said in a CNN interview Friday. U.S. officials rejected the notion that they are not acting. They emphasized that Obama moved quickly in Iraq with airstrikes and said that this month’s operations there are the first step in a larger strategy against the Islamic State. They indicated that they will not be pushed into an immediate response to recent events in Syria. “The dynamic that you want, that I think is possible, is that [Islamic State] has overreached and overextended itself, both in terms of the territory it’s tried to claim, and the number of enemies it’s managed to make,” a senior administration official said. Limited airstrikes in Iraq, and the formation of a more inclusive version of Iraq’s Shiite-led government, will encourage Sunni Arab states to work together, under U.S. leadership, in ways that have eluded them thus far, the official said. He added that the “international outrage in countries like Britain, France, Australia and Canada” over militants’ brutality, and the threat from Western passport holders within the Islamist organization, will make those countries more willing to participate in military and other operations against the militants in response to a patient and well-conceived U.S. strategy. U.S. allies say they have a residual well of confidence in Obama despite what they saw as the failure of U.S. leadership over the past year in Syria. “What I do regret,” said a senior European official, is that the Islamic State organization has become “exactly what we feared” last year, when Obama held back in arming moderate rebel forces in Syria and reversed course on U.S. military action there. The Syria airstrikes, planned last August to punish President Bashar al-Assad for using chemical weapons and to destroy his weapons program, might have avoided the current mess by sending a message to Syrians and U.S. allies that Obama was engaged and recognized the growing Islamist threat, said the official, who spoke on the condition of anonymity to avoid publicly criticizing the president. But the official believes that this summer has been different. Obama’s taking the lead on sanctions against Russia — and pressing reluctant Europeans to join — and the airstrikes this month against Islamic State in Iraq have gone some distance in restoring allied confidence in the president. Obama addressed the global angst during a Friday fundraiser for the Democratic National Committee in Purchase, N.Y. He said that anyone watching the nightly news might feel that “the world is falling apart.” He acknowledged these are challenging times and that an unsustainable “old order” that had been in place for decades in the Middle East was destined to come apart. “What we are seeing is the old order not working, but the new order not being born yet — and it is a rocky road through that process, and a dangerous time through that process,” he said. American leadership “has never been more necessary, and there’s really no competition out there for the ideas and the values that can create the sort of order that we need in this world. . . . Our values, our leadership, our military power but also our diplomatic power, the power of our culture is one that means we will get through these challenging times just like we have in the past,” he said. Jim Lindsay, senior vice president at the Council on Foreign Relations, said Obama’s inability to inspire confidence among critics has more to do with the complexity of the problems than the president’s leadership style. “He has a sort of perfect storm of messy problems, lousy options, ambivalent allies and a skeptical public,” he said. Obama’s attempt at reassurance begged the question not only of exactly what course of action he will decide to take, but whether those policies will be too little, too late. The crises in Ukraine and Syria-Iraq have overshadowed equally turbulent situations where the administration’s track record has not been encouraging. This summer’s war between Israel and Hamas in the Gaza Strip continued for weeks, despite repeated U.S. efforts to stop it, until a tentative cease-fire was agreed upon under Egyptian auspices last week. Despite two emergency visits by Kerry in the past several weeks, Afghanistan appeared headed toward a political train wreck, as the two candidates vying to replace President Hamid Karzai continued to dispute the results of this summer’s election. With the withdrawal of U.S. combat forces in December fast approaching, it remains uncertain whether there will be a government to agree to Obama’s plan to leave nearly 10,000 troops there for training and counterterrorism missions. The U.S. accounts for about 73% of the roughly $1 trillion in total military spending by NATO countries each year. Americans have long complained about footing the bill to defend European allies. The U.S. accounts for about 73% of the roughly $1 trillion in total military spending by NATO countries each year. U.S. officials want a commitment from other countries to contribute more, given the renewed threat from Russia. The NATO gathering next Thursday and Friday in Wales will draw President Barack Obama and 27 allied leaders to weigh strategies for Ukraine, Afghanistan and other trouble spots. The final session is aimed at agreement for more military spending. Exactly what it will require of allied countries is likely to be the meeting's hardest-fought battle, a senior NATO diplomat said. This summit was going to be crucial even before Russia's conflict with Ukraine this year. Founded in 1949, the alliance spent 40 years countering the threat of Soviet tanks rolling into Western Europe. Since the Cold War ended, NATO has been embroiled in missions in the Balkans and Afghanistan. Last year, with its Afghan role winding down, and Russia seemingly a friend, NATO was seeking to redefine its purpose. Mr. Putin quashed any further soul searching. The summit is now likely to launch a third phase for NATO, a pivot back to defending Europe, completing Russia's transformation from a partner to a potential adversary. Western military leaders were taken aback when Russia fielded a large military force within 72 hours and used it to invade Crimea. By contrast, the NATO Response Force—used once, after a 2005 earthquake in Pakistan—can take as long as 30 days to deploy. "There is pretty wide acceptance that this is no longer adequate," a senior Western diplomat said. NATO leaders plan to approve creation of a faster response force at the summit. Poland and other allies near Russia want new NATO bases on their territories. But most NATO members see an improved "readiness action plan" as a less aggressive, more flexible option. A firm response to Russia will cost more money, a sensitive topic for many countries. 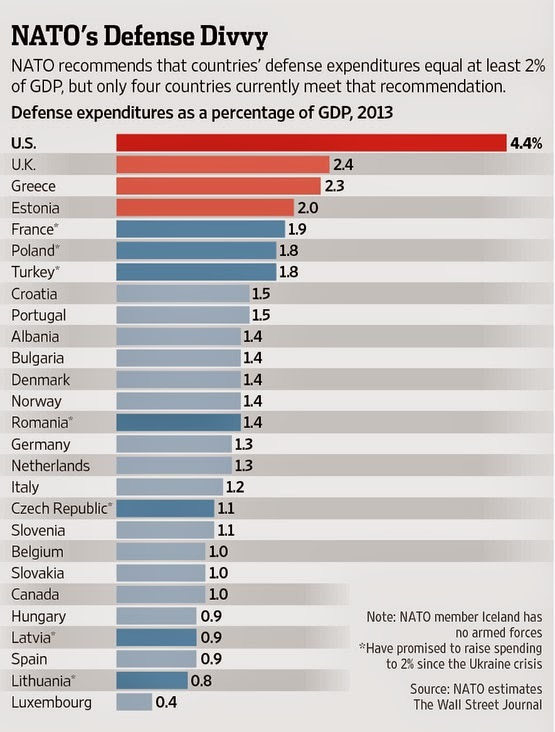 NATO's 28 allied countries agree to spend at least 2% of their GDP on defense. But only the U.S., U.K., Estonia and Greece do. Since the Ukraine crisis, seven more countries have committed to that benchmark, although it will take several years for some to reach it. Europeans have for years said their frugality stemmed from struggling economies and a peaceful regional landscape. But now, their economies are better and security worse, giving the U.S. an opening to press its case. "Europe has a lot of work to do to police its own backyard," said Rep. Jim Cooper (D., Tenn.), a senior member of the House Armed Services Committee. "It's easy to shirk responsibility when you can turn over all the world's problems to the world's only superpower, the U.S."
But, Mr. Cooper added, "I was struck by how many ambassadors from NATO countries were apologetic" about paltry military spending during a recent meeting in Washington. "The Ukraine incursion has scared just about every European nation." Russia has increased military spending by 50% over the past five years, while NATO allies have cut theirs by 20% over the same time. "Obviously, this is not a sustainable situation," Secretary-General Rasmussen said. The push is an attempt to counter Republicans’ many advantages in this year’s races, including polls that show Republican voters are much more engaged in the elections at this point — an important predictor of turnout. And the terrain is tricky: Many of the states where the black vote could be most crucial are also those where Mr. Obama is deeply unpopular among many white voters. So Democratic senators in places like Arkansas, Louisiana and North Carolina must distance themselves from the nation’s first African-American president while trying to motivate the black voters who are his most loyal constituents. The black vote could prove particularly decisive in four Southern states: Georgia and Louisiana, where African-Americans make up more than 30 percent of eligible voters; North Carolina, where they are 22 percent; and Arkansas, 15 percent. While minority turnout traditionally declines in nonpresidential election years, there have been midterm elections in which Southern blacks played a pivotal role. An example occurred in 1998, when President Bill Clinton was, like Mr. Obama, under fire from Republicans and nearing the end of his White House years. Republicans are skeptical of the effort, saying that ultimately, voters’ frustration with Mr. Obama will determine the outcome of the races. “He’s not as weak as Bush in ’06 or Obama in ’10, but there is a fatigue, a sense that he’s ready to move on and we’re ready to move on, too,” said Glen Bolger, a Republican pollster. Given Mr. Obama’s unpopularity, national Democratic leaders have essentially encouraged their party’s candidates to make clear their differences with the president, especially in the most conservative states. And the candidates have done so, sometimes rather colorfully. BOSTON — With the casino industry showing signs of retrenchment, voters in Massachusetts may do something that voters nowhere else have done, at least in the last century: slam on the brakes on casino gambling. Massachusetts was one of the last states to climb aboard the casino craze, approving legislation in 2011 to allow three casinos and a slots parlor. Now it may be the first to reverse itself, with voters deciding in November whether to repeal the law before a single casino has been built. “No state has ever repealed expanded gaming legislation since the modern industry of gambling started in 1931 with Nevada,” said Clyde W. Barrow, a political scientist at the University of Texas-Pan American who studies gambling. Why is Massachusetts having second thoughts? When the legislature voted to allow casinos, the state was limping through a nationwide recession. And Massachusetts gamblers continued to plunk their money down in other states. But since then, the economy has improved. Red flags have been raised about the overall health of the casino industry. And the tortuous process of awarding casino licenses here has dragged on for three years, with no tangible benefits. The debate has unfolded against a backdrop of bleak forecasts for the industry. In July, Fitch Ratings said industry weakness would persist, citing the saturation of regional markets, stagnant wages among lower-income players and the growth of online gambling. The steady drumbeat of bad news from Atlantic City has also caused concern here. Atlantic City is plagued with problems, many of them caused by competition from casinos in neighboring states. Four of its 12 casinos are shutting down this year, putting 8,000 people out of work, even as casino fever intensifies near New York City. Despite this grim environment, casino advocates here express confidence that they will prevail. They say Atlantic City’s woes are not relevant because New Jersey put 12 casinos in one place; Massachusetts has planned just three, in three separate regions. Their chief argument is that casinos will fuel an economic boon, providing 6,500 construction jobs and 10,000 permanent jobs, virtually all of them unionized, with benefits and an average yearly salary of about $45,000 (more with tips). The casinos have pledged millions of dollars annually to their host and surrounding communities, thanks to the “repatriating” of cash that Massachusetts residents will no longer be dropping in other states. The campaign to repeal casinos maintains that the promise of jobs and prosperity is hollow. It says casinos will not bring a net gain of jobs but a net loss, that people will spend their discretionary income at the casinos and sap local businesses, forcing them to lay off workers. What critics do believe is that casinos will destroy their communities with more crime, traffic and addiction and that Massachusetts should not rely on a predatory industry to improve its economy because it will only fail. The anti-casino campaign, called Repeal the Casino Deal, acknowledges that it faces an uphill battle. It lacks the resources of the casinos. It lacks a simple, bumper-sticker message like “jobs” to appeal to voters. MARK SHIELDS: Well, American role is an obligation. I mean, in 1994, for — for Ukraine to surrender its considerable nuclear arsenal at that time, there was a guarantee given by the United States and Western democracies and European nations of support and defense and security. And I don’t think there is any question that that obligation is on the table right now. I mean, the plausible deniability that Putin could sort of hide behind has just been totally exposed, totally sabotaged, totally revealed for the fraud that it is. This, quite frankly, is an attempt on his part, whether it’s an alley or an avenue, down to Crimea and his concern about the water port and openness there. But I think the obligation is there. And I think the world is watching. And NATO next week will bring it to a front. HARI SREENIVASAN: Is this NATO’s responsibility more than ours? DAVID BROOKS: Well, it’s everybody’s. This is — both the Middle East and what is happening in Ukraine are symptoms of the vacuum, a vacuum in the post — or in the 21st century order, and it’s partly an American — a vacuum of American power. It’s certainly a vacuum of European cohesion, power. It’s certainly an inability of the major countries of the world, including China, to get together and actually impose an order that will be good for everybody. And so, when you have no order, then the wolves get more aggressive. And Putin has gotten more aggressive. And I think the administration, I think a whole lot of people in the administration have been very aggressive verbally, rhetorically. They understand the source of the problem. I think the president has not been aggressive enough. This is an invasion. When you take over a part of the country to get — so you can have a land route to Crimea, that’s an invasion. It’s not a continuation of what they have been doing. It’s not low-level harassment. It’s a major invasion on European soil. And so you just can’t allow that to happen. And, so, to me, the first step has to be, if the Russians are pouring sophisticated material into the — their proxies, then the West has to pour some more sophisticated material into our proxies, essentially. And that’s been an issue that has been debated over and over again. But I think raising costs for Putin, showing some commitment to the Ukraine, both financial and militarily, has to be at least the first step. HARI SREENIVASAN: So, we have had definition of invasion. Let’s — let me just pivot back towards Syria for a second. If the U.S. makes attacks inside Syria, a sovereign nation, is that not a declaration of war? MARK SHIELDS: I think — I think it meets certainly one definition of a declaration of war. That’s why I think the debate — I mean, the debate that we didn’t have 12 years ago was — for example, if we’re going to do this — David is talking about 30 years or 20 years or whatever it is, a long twilight struggle, call it what you will — I mean, this is going to — it’s a country fights a war. An army doesn’t fight a war. And if this country isn’t willing to fight a war, then we should never send an army. That is really — it’s not just something that we’re rooting or supporting the troops and standing up at a ball game. This — we would be the first Americans since the Civil War not to accept the responsibility of paying for a war. In every war since the Civil War, Americans have increased their taxes. we need a debate on sacrifice being — the quality of sacrifice in war, as well as what the objective is. How do we know what our mission is? How will we know when we have achieved it? I just — I think it’s a — this debate is so urgent and so necessary to understand and to agree upon what we’re undertaking. DAVID BROOKS: I do agree with that. And the president has to — is playing a role. I thought the important statement he made was not the one that got all the attention, that, “I have no strategy.” He keeps calling ISIS a cancer. And I think that’s the right metaphor. That suggests it’s going to spread, and it will spread unless you stop it, which if you diagnose this as a cancer, which I think is the right diagnosis, then you have got to do something about it. And the paradox of the Obama presidency will be, it will be a much more militarized presidency in its final two years than any of us could have imagined. But the alternative is a Middle East that is much worse when he leaves office than when he took off — over, a Europe that is in much worse shape than when he leaves office than took over, a global world order that is in much worse shape. And so figuring that out — and it’s not going to look like the wars of World War II. It’s not going to look like Iraq and Afghanistan. It’s going to be sort of a low-level war fought on all sorts of fronts, militarily, financial, otherwise. Figuring that out is still in the future for us all. MARK SHIELDS: To his credit, the president doesn’t have about him that sort of counterfeit, synthetic macho that Americans leaders oftentimes affect at a time of national emergency. He doesn’t have a swagger about him. And I think that is to his credit. At the same time, a president’s job, especially at a complex time like this, a confusing, confounding fast-changing world, is to be the explainer in chief. And he was anything but that yesterday. And that’s a responsibility that he has to fulfill. DAVID BROOKS: That’s because he’s being dragged in against his will. He doesn’t want to be here. I don’t blame him. Nobody wants to be here. But even within his own administration, within his own party, there are lot of foreign policy experts who take a more aggressive stand. His posture on foreign affairs has always been to dig in his heels and get dragged often against his will. And he’s going to dragged against his will to be much more assertive around the world in the final two years. In a region where states such as Iraq and Syria are literally fragmenting, Mr. Brzezinski urges an approach focused on the handful of what he categorizes as truly "viable" states—Turkey, Iran, Egypt, Israel and Saudi Arabia—to confront Islamic State, which also is known by the acronyms ISIS and ISIL. U.S. officials, who privately concede they have no great options for bringing Islamic State to heel, recognize the allure of such a new alignment. President Barack Obama has referred obliquely to the possibility in several public comments in the past week or so, and officials say privately they are exploring ways to form a working coalition. But U.S. officials agree that matchmaking such often bitterly antagonistic bedfellows is no simple task. When asked about the possibility that U.S. warplanes might be attacking Islamic State alongside the army of Syrian President Bashar al-Assad—whose overthrow is an explicit goal of American policy—State Department spokeswoman Jen Psaki this week cautioned: "Just because the Syrian regime may be taking on ISIL or speaking publicly about that, and certainly the United States is, that certainly doesn't mean we're on the same side of the coin here." The challenges go well beyond simply getting mortal enemies to work together. Even when such arrangements can be forged, they are by nature fraught, filled with internal contradictions and practical pitfalls. Because the deals are often secret, all sides tend to freeload, collecting the benefits from the other side while not really cooperating themselves. For example, the Obama administration worries that the Assad regime could take advantage of U.S. airstrikes against Islamic State fighters to keep its own ground troops focused on fighting U.S.-backed Syrian rebel groups. And the closer the U.S. moves toward an enemy, the more likely it is that longtime friends get upset. For example, edging too close to Iran could spike efforts to keep Israel and Saudi Arabia on board, and vice versa. "If you cooperate with one group, you lose another," says Emile Hokayem, a Middle East security analyst with the International Institute for Strategic Studies. "It looks good on paper, but it's impossible to implement." Still, recent events in the region have shown how nations normally or publicly at odds can work together behind the scenes when their separate interests converge. Relations between Egypt and Israel have grown increasingly strained. But the two have worked in lock-step recently to squeeze the Palestinian Hamas organization, which both see as a threat. And even as the U.S. and Iran have vied for power and influence in Iraq they have learned to coordinate when they perceive common interests. "We are watching you, and you are watching us. If you look for cooperation in the field, you can find it. And when you find it, it will be with the permission of the leaderships," says Hossein Sheikholeslam, a former Iranian parliamentarian and now a foreign-policy adviser to Iran's hard-line speaker in parliament. Indeed, the most intriguing reality emerging in the struggle against Islamic State is how the U.S. finds itself pulling in the same direction as Iran, the main regional supporter of Mr. Assad's Syrian regime. Islamic State's hyper-sectarian Sunni fighters already have taken over a big chunk of Syria, and have gone on the offensive against Shiite militias and the Shiite-led Iraqi government Iran supports. Both the U.S. and Iran deny overt or covert coordination. Yet Iran joined the U.S. in pressuring Iraq's polarizing leader Nouri al-Maliki to step down. And both the U.S. and Iran are lending direct military aid to Kurdish fighters in Iraq to counter Islamic State. Both sides are quick to point out their many disagreements, and are careful to fence off other issues from negotiations over Iran's nuclear program. At the same time, some observers on both sides believe that a nuclear deal could improve U.S.-Iranian cooperation in other areas, such as fighting Islamic State. "I am cautiously optimistic about what we might be able to do with Iran," says Brent Scowcroft, another former national-security adviser. "If in fact we can make any kind of breakthrough on the nuclear issue, I think that opens the possibility that we may be able to treat Iran very differently, and their attitude may be very different." Mr. Scowcroft, who advised Presidents Gerald Ford and George H.W. Bush, cautions that he "wouldn't try to oversell" the possibilities with Iran. In an indication of the obstacles, the Obama administration on Friday announced some additional economic sanctions against Iran because of its nuclear program. Others are more skeptical of a working U.S. relationship with Iran or, especially, Syria. That is partly because of a problem in trying to exercise influence through intermediaries: It is never clear how much influence the intermediaries actually have. While Iran has been a major backer of Mr. Assad, that doesn't mean his regime follows every Iranian order, according to Iranian and many U.S. analysts. The Assad regime has resisted or undermined several Iranian initiatives to broker deals to tamp down violence in Syria, say people familiar with these situations. "I can tell you who are not bedfellows: Iran and the Assad regime," says Ryan Crocker, former U.S. ambassador to both Iraq and Syria. Mr. Crocker, however, suggests an even more provocative possibility: a de facto alliance with the Nusra Front—the al Qaeda offshoot in Syria (and U.S.-designated terrorist outfit) that is one of the few groups directly battling Islamic State. Nusra already works openly with U.S.-backed rebel groups in Syria, and it maintains communication with U.S.-ally Qatar, which this week helped engineer the release of an American journalist being held by Nusra. Many took this as a signal that Nusra wants to work through the Qataris to be seen as player in any anti-Islamic State configuration. If the U.S. chooses to launch airstrikes Mr. Obama is considering against Islamic State inside Syria, and Nusra fighters then make inroads battling them, the U.S. would confront "a very interesting decision" on whether to openly include Nusra as part of a larger group willing to help take on Islamic State, Mr. Crocker says. Another U.S. ally critical to winning the battle is Turkey, a Muslim country whose long border with Syria includes areas Islamic State controls. The U.S. and other countries have been concerned about Turkey's support for some hard-line Islamist groups, though not Islamic State, and hope it now will work harder to prevent Islamic State's growing body of foreign recruits from moving across the Turkish border to reach Syria. Turkey already is averting its eyes to the arming of Iraqi Kurdish groups by both the U.S. and Iran as Kurdish militias battle Islamic State. The Iraqi Kurdish groups have forged close ties with the Turks in recent years, after decades of enmity. Some analysts say Turkey, as well as the U.S., also may eventually have to accept a more active role for Syrian Kurdish militias who are facing down Islamic State directly, despite those militias' links with Kurdish militants who have attacked Turkey in the past. Mr. Crocker suggests that, in a cooperative international effort, a wealthy country such as Saudi Arabia might be persuaded to give preferential loans to financially strapped Turkey in return for helping more in the struggle against Islamic State. The Saudis, for their part, have already had to swallow hard and accept for the first time a Shiite-led government in Iraq. They will now have to swallow harder, many analysts say, and encourage Sunni tribes within Iraq to follow that government's lead against Islamic State if it is to be defeated. But the Saudis also are deeply suspicious of other players in a potential coalition, not least the U.S. They mistrust the Obama administration because it didn't robustly support less-extreme Syrian opposition groups when Islamic State was just emerging. They are angry at Turkey and Qatar for supporting Islamic groups the Saudis consider too radical. And they consider Iran a threat to their interests at least as large as Islamic State. Still, in a sign that a common enemy may be pulling even the Iranians and Saudis a bit closer, Saudi Arabia's foreign minister this week met with an Iranian deputy foreign minister, the highest-level encounter since the election of Iranian President Hasan Rouhani last year. The Islamic State threat also is providing at least some common ground among the U.S. and its colleagues in the big-powers club, Russia and China. The U.S. sees Islamic State as not only a threat to its interests in the Middle East but also a potential source of terrorist attacks. Russia sees a force that threatens to build ties and stir up more activism among the Chechen Islamists with whom President Vladimir Putin has waged a bloody struggle. China sees a group that threatens to inspire more activity among already-restive Islamists in its northwestern Xinjiang province. Still, Washington's tensions with both China and Russia on other fronts are getting in the way of cooperation these days, especially since Russia's annexation of Crimea and its intervention in eastern Ukraine. Whatever the level of international cooperation against Islamic State, one question is what form it might take. There is little communication between some of the odd-bedfellows candidates, and few existing alliances that would kick in elsewhere in the world under such conditions. This means that cooperation likely would be ad hoc or secret, or that some new structure would be improvised. Zalmay Khalilzad, who served as ambassador to both Iraq and the United Nations, has suggested establishing a "contact group" in which regional players could coordinate strategy, and a presidential envoy to oversee execution of joint efforts on the ground. WASHINGTON—President Barack Obama is considering delaying his expected changes to immigration policy until after the midterm elections, amid pressure from Democrats in tough Senate races, people familiar with White House deliberations said Friday. Mr. Obama has been expected to act soon to ease deportations of illegal immigrants, including potentially giving temporary work permits to millions of people in the U.S. illegally. In June, after House Republicans declined to pass an immigration overhaul, he said he would act on his own by summer's end to make changes to the immigration system. Republicans say Mr. Obama would exceed his legal authority by acting without congressional approval, and several Democrats running in conservative states have urged him in recent weeks not to act on his own. Now, White House officials are debating whether to put off some or all of his new policy until after the November election, in which control of the Senate is at stake, according to people familiar with the discussions. The internal debate comes as the White House has received good news on what has been a major immigration problem: Government figures show the summer surge in unaccompanied children illegally crossing the Southwest border has significantly slowed. During the first 25 days of August, an average of 104 unaccompanied minors have been apprehended each day trying to illegally cross the Southwest border. That is less than a third the rate recorded in May and June, when about 350 children were being caught daily, according to new data from the Department of Homeland Security. The daily rate of unaccompanied-minor apprehensions is now lower than it has been in any month since early 2013, well before the surge in child migrants began. Some 2,604 unaccompanied minors were apprehended in the first 25 days of August, far less than the more than 10,000 in May and June. The falloff reflects fewer attempted crossings. As a result, the Department of Health and Human Services is no longer looking for places to open temporary shelters, a scramble that had set off controversies in communities across the country. In addition, the agency is no longer housing children at three military bases that had been set up for temporary use. The drop in apprehensions theoretically could give Mr. Obama more freedom to pursue the expansive changes to immigration policy that he is now considering. If the border-crossing numbers had remained as high as they were in June, Mr. Obama might have found it harder to ease deportation rules. But even with the numbers falling, the White House is considering holding off on all or perhaps just part of the executive action, at least until after the election. Democratic Sens. Mark Pryor in Arkansas, Kay Hagan in North Carolina, Mark Begich in Alaska and Jeanne Shaheen in New Hampshire, all in tough re-election races, have said immigration should be addressed by Congress, not the White House. At a news conference on Thursday, Mr. Obama signaled that his timeline was unclear. Asked whether he was thinking of delaying an announcement, he suggested that the child-migration situation could affect his timing. "Some of these things do affect timelines, and we're just going to be working through as systematically as possible in order to get this done," he said. Mr. Obama faces intense pressure from immigrant-rights advocates to move forward as planned. He already has pushed back his timeline for taking executive action once this year. Brad Dayspring, spokesman for the National Republican Senatorial Committee, said Mr. Obama's executive action on immigration would be unpopular no matter when he made it. "Whether President Obama declares executive amnesty in September, October or November, he has neither the legal authority nor the public support to do it," he said. In addition to scaling back deportations, Mr. Obama is also considering changes requested by business groups to make more visas available for legal immigration, people familiar with White House deliberations have said. One person familiar with the White House conversations said it is almost certain that Mr. Obama will expand a program that now gives work permits to certain young people who were brought to the U.S. as children. How many people would benefit depends on several conditions not yet set, such as the length of time someone must have lived in the country to qualify. Large numbers of minors had been crossing the border this summer, driven in part by gang violence and economic hardship in Central American countries. Officials are not certain why the number has fallen. Some point to an intense effort to communicate to Central Americans, who account for the bulk of the migrants, that minors who arrive here illegally will not be given permission to stay. In addition, the Mexican government has increased border security on its southern border, an effort to stop migrants earlier in their journey north. "The situation at the border remains fluid," said Kenneth Wolfe, a spokesman for the Department of Health and Human Services. "It is too early to tell whether these trends will be sustained over time." The First War to Run on Oil - World War I made gasoline central to combat and world politics. Half a century ago, on the 50th anniversary of World War I, the diplomatic historian William L. Langer described the war as "the wellspring of our discontents." It remains that now, as we mark its 100th anniversary: Many of today's most virulent struggles, from Ukraine versus Russia to the Middle East and its borders, have their origins in the Great War and its outcome. Indeed, the Islamic State boasts that its self-declared new "caliphate" is erasing the boundary between Syria and Iraq set by the World War I peace settlement. For the first half century after the discovery of oil in Pennsylvania in 1859, the oil industry was in the business of illumination—providing kerosene for the lamps that pushed back the night in urban and rural areas. John D. Rockefeller became the world's richest man as a merchant of light. Only at the beginning of the 20th century did automobiles—powered by gasoline, which had been a virtual waste product—start to take to the roads. But their numbers were still tiny. In the years just before 1914, the world's major navies began to shift toward replacing coal with oil in hopes of gaining speed and maneuverability and cutting refueling time. Winston Churchill, as first lord of the Admiralty, was the great champion of the Royal Navy's switch to oil, proclaiming, "Mastery itself was the prize of the venture." But in the years running up to the war, he encountered great opposition from both the Royal Navy and Parliament. Relying on oil, traditionalists argued, would leave the Royal Navy dependent not on its traditional, reliable supplies of Welsh coal but on oil from a highly unstable and unreliable nation: Persia (now Iran). In response, Churchill declared what would become the enduring principle of energy security: diversification. "Safety and certainty in oil lie," he said, "in variety and variety alone." That value was proved in the very first months of the war, when the German army rapidly advanced almost to the doorstep of Paris. The French government evacuated the capital, and it seemed likely soon to sue for peace. The military governor of Paris, Gen. Joseph Gallieni, violently disagreed. He was convinced that the Germans could be stopped, but with the railway system disrupted, there seemed no way to move enough troops. In a brilliant act of improvisation, Gallieni commandeered all of Paris's taxi cabs to rush French troops to the front—and halted the German advance. Motorized warfare had arrived. Oil and the internal combustion engine quickly transformed the battlefield. The British Expeditionary Force that landed in France in August 1914 had a mere 827 motorcars and just 15 motorcycles. By war's end in 1918, British military vehicles included some 56,000 trucks, 23,000 motorcars and 34,000 motorcycles and motor bicycles. When the U.S. entered the war in 1917, it brought another 50,000 vehicles to the European front. All of this enabled the Allies to move troops and supplies swiftly. After the war, some described the Allied victory as the triumph of their trucks over Germany's locomotives. But it wasn't only the truck that proved transformative. Militaries looked frantically for a response to trench warfare and the machine gun, which made crossing the battlefield lethal. The answer was the oil-powered armored vehicle, based on a new contraption that had just appeared in the U.S.: the agricultural tractor. Developed under various code names, including the "cistern" and the "reservoir," it eventually became known as the "tank." When the German High Command declared in October 1918 that victory was no longer possible, the first reason it gave was the introduction of the tank onto the battlefield. Oil-powered vehicles proved revolutionary above the battlefield too. Before the war, a top French general had dismissed the airplane as "good sport, but for the Army the aeroplane is worthless." As late as the start of 1915, the British aviation industry had been able to build just some 250 planes. But innovation came quickly; by that summer, every plane that had been in the air at the beginning of the war a year earlier was considered obsolete. Over the course of the war, Britain produced some 55,000 planes; Germany made 48,000. Airplanes were first used for reconnaissance, then for aerial combat and bombing—with dramatic impact. The speed of new aircraft doubled to 120 miles an hour, and some operated at a height of up to 27,000 feet. What the chief of the British Air Staff said of the Royal Air Force also applied to military aviation in general: "The necessities of war created it in a night." And of course, all their engines ran on oil. But nothing dramatized the new centrality of oil so much as the German submarine attacks on U.S. shipping, particularly tankers carrying oil to Europe from the U.S. (then by far the largest source of oil). As tanker sinkings mounted, the Royal Navy even considered giving up oil and going back to coal. "The Germans are succeeding," warned the U.S. ambassador in London. "They have lately sunk so many fuel oil ships" that Britain was "in a perilous situation." By coordinating shipping supplies and instituting convoys, the Allies managed to stave off the U-boat threat and keep the oil flowing across the Atlantic—but only just in time. Within a few short, brutal years, a war that had begun with expectations of cavalry charges ended with worries about oil supplies. Such was the transformation that, just days after the Armistice, Lord Curzon, who was about to become Britain's foreign secretary, declared, "The Allied cause had floated to victory upon a wave of oil." Oil had become the strategic commodity, essential for the exercise of power. It remains that today—as well as a "wellspring of our discontents." —Mr. Yergin is the author of "The Prize: the Epic Quest for Oil, Money, and Power" and "The Quest: Energy, Security, and the Remaking of the Modern World." He is vice chairman of IHS, a research and consulting firm. Around 2000 or so I went to Atlantic City by myself (not the usual Mode of Operation for Sid and Sally). I had watched Miss America growing up, and had an itching to play a little blackjack (the latter being the determinative factor), something definitely not in Sally's DNA. Anyway, I flew into Philadelphia, and took a train over to Atlantic City and stayed a couple of days. Although my generation is that of the Drifters who of course sang Under the Boardwalk, I had always wondered what a boardwalk looked like. I knew piers that go into the Atlantic Oocean, but never had seen a boardwalk. Altantic City's casino district, or whatever where all the casinos are located is called, fronts on the boardwalk. Having seen it, I had nothing to write home about; it was OK; but I could say -- to anyone what cared including those still reading this post -- that I had been there, done that. But loving downtowns as I do, I naturally over my visit ventured into Atlantic City a couple of blocks off of the boardwalk. I wasn't prepred. It was like an atomic bomb had hit the place. Anyway, I have followed the City's fate before and after my visit. The following is an update. ATLANTIC CITY, N.J.—Early Tuesday morning, gamblers at the Revel Casino Hotel will be asked to leave, and security guards will take over at the gleaming, 47-story building on the north end of the boardwalk. The sudden closing of the two-year-old Revel, plus two other casinos shutting their doors in the next few weeks, marks the end of Atlantic City's decades-long reliance on gambling to stay afloat. When Atlantic City opened its first casino in 1978, state and local officials talked up gambling as the path to revival for a shore resort plagued by high unemployment and white flight to the suburbs. While the city had its moments—even surpassing the Las Vegas Strip in gambling revenue for much of the 1980s and 1990s—many politicians, residents and business people are giving up on the dream. The city is bracing itself for the loss of more than 6,000 jobs at the Revel, Showboat and Trump Plaza, and collateral damage as businesses and the city itself cope with the aftermath. "Looking back, people should have been preparing for this day for the past couple of decades," said John Palmieri, who leads the New Jersey state redevelopment efforts here, citing the proliferation of gambling locations across the U.S.
Other places have been hit, too. Some casinos in Pennsylvania, Delaware, Connecticut and Maryland are seeing their fortunes decline, along with some near Lake Tahoe in Nevada. But few wagered as much as Atlantic City, where casino property-tax revenue makes up about 65% of the city's budget. The city of 40,000 is now a prime example of the danger of putting too many economic development eggs in the same basket, and failing to invest in other avenues of growth. As other parts of the nation experience a slow economic rebound, Atlantic City is going in the other direction. Annual property-tax revenue from the three casinos that are closing totaled more than $30 million, or about 15% of the city's budget, city officials said. Mayor Don Guardian said Atlantic City would have to cut hundreds of employees and slash the city budget to make up for the losses. The city also is proposing a 29% property tax increase for homeowners. The jobless rate, at 13% and likely to rise, already is more than twice the U.S. rate of 6.2%. "This is worse than Sandy," said Eric McCoy, a local minister who leads a regional church association. "The storm eventually went away. This is going to continue." When the Revel opened just two years ago, it was hailed by Republican Gov. Chris Christie and others as a game-changer. Instead, it was hurt by competition from Pennsylvania's casinos and by poor business decisions, including building its own power plant that lost as much as $2 million a month. The casino hotel had an operating loss of $185 million in 2013, and filed for bankruptcy protection from creditors twice before this summer's announcement it would close for good. Atlantic City boomed through the 1920s Prohibition Era, with fancy restaurants and grandiose hotels, along with Hollywood performers. Trains were often packed with vacationers headed to the swanky resort. Its heyday is captured in HBO's "Boardwalk Empire," featuring the ups and downs of Mayor Nucky Thompson. Its streets inspired the modern "Monopoly" board. After World War II, the city's fortunes declined. Paul Steelman, a casino architect who grew up here, said he would run red lights late at night because he was afraid he would get carjacked. The 1964 Democratic convention here wound up focusing national attention on a city in disrepair. By the 1980s, casinos had turned Atlantic City into one of the most visited destinations in the nation, as tourists came not just to gamble, but to watch heavyweight bouts featuring Mike Tyson and rousing concerts at Boardwalk Hall. New revenue from the boom brought improvements—new schools, a shopping center, new roads and playgrounds. But the resort once known for a horse that dived from a pier into the Atlantic Ocean became a one-trick pony. Even as gambling revenues reached a peak of $5.2 billion in 2006, the city didn't market its beaches, which are often eerily empty. It now spends $30 million a year on marketing, far less than Las Vegas, with a budget ofabout $120 million. It had no tourism alliance until 2011. Las Vegas also faced increased competition in the late 1980s, and "was worried about Atlantic City" as a competitor, said David Schwartz, director of the Center for Gaming Research at University of Nevada, Las Vegas. Las Vegas officials focused on creating a different kind of economy, with pirate shows for children, luxury retail shops, amusement rides, performers like Celine Dion and shows like Cirque de Soleil. Billions of dollars in investment poured in with the Mirage, the Bellagio, the Venetian and Mandalay Bay, among other properties. Some Atlantic City casinos have bucked the down trend. Resorts Casino Hotel, the first to open in 1978, remade itself with new restaurants and a full-scale makeover. The Borgata, a property with penthouse spas, tropical indoor pools and high-end restaurants, remains more than 95% occupied on most nights. Analysts say the closures could help the remaining eight casinos survive as customers try their gaming floors. Mr. Guardian, the mayor, said Atlantic City has made significant improvements in cleaning up residential blight. Mr. Christie has a five-year plan for Atlantic City that includes another convention center, more flights into the small airport and more efforts to promote offerings such as beach concerts, aerospace shows and wine tastings. Officials talk eagerly about the Bass Pro Shops hunting and outdoors-goods store that is expected to open next year. Some wonder if a smattering of new restaurants and shops, along with a new convention center, will overcome the huge loss of gambling revenue. 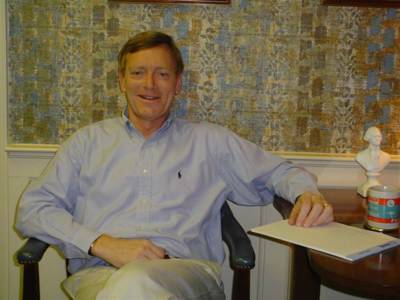 "There are a lot of convention centers sitting vacant in a lot of cities," said Mr. Steelman. So far, Christie administration officials have declined to say if they have new ideas for Atlantic City beyond ones discussed in their previous plans. The governor has called for a special meeting of state and local officials on Sept. 8 to discuss the city's future. "We think Atlantic City can be a vibrant, healthy city," said Lou Goetting, Mr. Christie's deputy chief of staff. "There is certainly room for growth and expansion." By now, President Obama's remark that "We don't have a strategy yet" has made the rounds. Republicans were quick to pounce on it, as well they should have. But while the White House went into damage-control mode, emphasizing that it was a reference to the lack of decisions about increasing military action in Iraq and/or Syria and not a lack of a broader strategy there, the damage was already done. As with all gaffes, the worst ones are the ones that confirm people's pre-existing suspicions or fit into an easy narrative. That's why "47 percent" stung Mitt Romney so much, and its why "don't have a strategy" hurts Obama today. Moreso, though, this strikes us as a legacy problem for Obama. For a president confronting a bunch of overseas crises in the final two-plus years of his presidency – including ones that involve or could involve U.S. force. -- “don’t have a strategy yet” could become a pretty unhelpful shorthand for his foreign policy if things don’t go well. During the period around the Oslo Accords, in the early 1990s, when peace seemed close and economic cooperation between Israel and the new, interim Palestinian Authority was considered an important part of a future relationship built on mutual dependency and confidence, factories in occupied territory were praised. WASHINGTON — As President Obama nears a decision on taking broad executive action to reshape the nation’s immigration system, Republicans are threatening to force a confrontation over what they describe as a power grab by refusing to finance some or all of the moves. Senator Marco Rubio, Republican of Florida, has said his party could seek to prevent Mr. Obama from taking unilateral action on immigration by removing the funding for it in the annual budget, which will be the top order of business when Congress returns from its break and must be passed by the end of September. Injecting the immigration issue into the annual budget discussions raises the possibility of a spending stalemate that could lead to another government shutdown in the fall. Such a confrontation would pose a risk for both parties: Republicans were largely blamed for the shutdown last year, and many Democrats are wary of an immigration vote just before they face voters in November. Republican leaders in the House and Senate say they have no intention of shutting down the government just weeks before the midterm elections. But the conservatives who are the most passionate opponents of any immigration action could press the issue when lawmakers return. Democrats have eagerly seized on the possibility of a shutdown fight, predicting Wednesday that voters will punish Republican candidates if the party uses the budget negotiations to block an immigration overhaul. “They’re willing to treat people who simply want to make a better way of life for themselves and their families inhumanely and use their Tea Party ideology to beat the president into submission if they don’t get their way,” Representative Debbie Wasserman Schultz of Florida, the chairwoman of the Democratic National Committee, said Wednesday in a conference call with reporters. At the same time, Democratic candidates for the Senate have urged Mr. Obama to delay any sweeping action on immigration. Democrats campaigning for re-election in conservative states worry that the president could fire up conservative voters if he acts unilaterally. White House officials said they had no intention of letting Republicans’ threats influence the timing or substance of an immigration announcement from Mr. Obama. The president has promised to reveal his intentions soon. He has said he is considering a unilateral move because of the refusal of the Republican-controlled House to pass an overhaul of the immigration system. If Republicans were to force a shutdown over the issue, it “would put not just their efforts to take the Senate, but potentially their efforts to keep the House, in great danger,” said Dan Pfeiffer, a senior adviser to Mr. Obama. Mr. Rubio said in a letter to Mr. Obama on Tuesday that he was “increasingly alarmed” by reports that the president could remove the threat of deportation for millions of illegal immigrants without consulting Congress. “If indeed you move forward on such a decision, I believe it will close the door on any chance of making progress on immigration reform in the foreseeable future,” Mr. Rubio said in the letter. Aides to the senator said he was not advocating a government shutdown to protest the president’s immigration actions. But they said that Mr. Rubio would want, and expect, a vote on any presidential immigration action to come up during the budget debate. What could happen next is uncertain. In 2013, Republican leaders in the House and Senate said they did not want the new health care law to lead to a government shutdown. But several conservative lawmakers had other ideas, and the resulting stalemate closed the government for 15 days last fall. Mr. Earnest said the president would not think twice about taking executive action on immigration because of the Republican threats. “The president is determined to act where House Republicans won’t,” he said. Also see article in The Washington Post entitled "Obama’s immigration decision could roil 2014 election" which I haven't read yet.